I really dislike buying pajamas. When it comes to shopping for fall/winter or spring/summer clothes, I bite the bullet and get those tops and bottoms and even the snow boots that they wear just three times some winters!! But pajamas? Seriously, the better quality ones are as high as $25 a pair and it just costs more as they get bigger! Gosh, I used to love buying pajamas when they were really little... all those cars and bears were so cute! But now the honeymoon is over. For years, I've told myself that they don't need to wear a fresh pair every night but then the question becomes - where do you put the pair that should be worn again? I've never found a solution because my kids still do not make their own beds and their bedroom is small. Thus, there is no place for a pajama-in-waiting. The kids never look for them either and they just get fresh ones from their drawers anyway. Basically, we end up with some awkward pile of once-worn pajamas that gets rifled through only when they've run out of pajamas. Number 1 called this "Circularo." He was very proud of it. It was very artsy. He also realized later on that he drew on the back of the shirt!. He doesn't care. He just wears it backwards. I may be the only person in America that has this strange pajama situation but maybe not the only person who hates buying pajamas. So if you happen to be in this camp, listen up! I have a solution that turned out to be an amazing in-home public service announcement ("PSA") campaign directed at my kids. Days later, he practiced making his own lines. He still likes "Circularo" best! I think Scribbles has other fabric paints so that he can make things his way. It's non-toxic too! Yeah! I also think the shape of this bottle is supportive to the writing grasp. Scribbles creators must have thought of this in advance! Short bottles are easier to keep steady! After we created curtains using Tulip Glow-in-the-Dark 3D Paint, the kids had asked for it again but I didn't know what they would paint on and so I held off. At the same time, I was well on my way to swearing off kids' pajamas. I was shopping on Lands' End for clothing and found that their plain white t-shirts were on sale for a mere $3.50 with a coupon code. Long-sleeve shirts!!!! But after I got them, I felt guilty. The kids have been wearing matching pajama sets starting from their infant stages and all of them sported cute designs! Now they looked like they were going to wear a uniform to sleep. But wait! What if they could decorate the pajamas? This is yet another cockamamie idea like my Ikea Curtain Rail Bed Tent but this time my husband won't give me a face because this one SAVES US MONEY! We got the Scribbles 3D Paint 20 pack and one evening we set out to make pajamas. 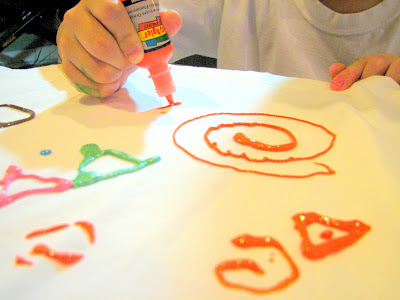 Ask a kid to squeeze paint bottles onto blank white surfaces? You can't have enough blank white surfaces! When I didn't know what to draw or how to draw it, I didn't panic. All I have to do is look around my house and I know there is help. Congrats to Mayla, the recent winner of Mindware's Imaginets! These beetles are everywhere! Actually, you can have enough blank white surfaces if you are Number 1 Son. Number 2 Son is kind of young to use the paint bottles effectively enough to make designs. He is satisfied with scribbles. But Number 1 Son always has an idea in that stubborn head. 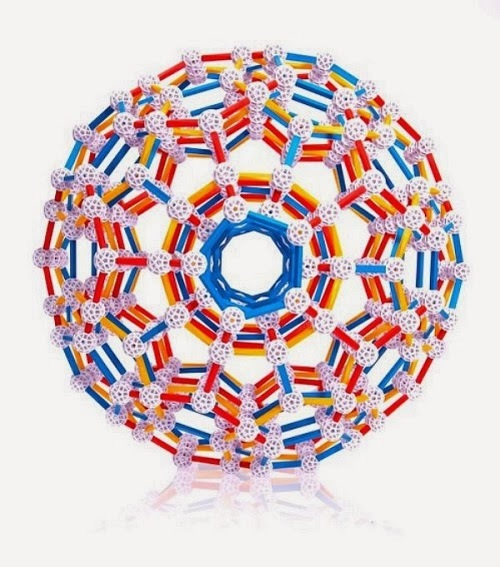 However, as I learned from Petra Pankow when playing around with the Tegu Pocket Pouch Prism. You have to surrender a bit. This is not really painting with a paintbrush and you should be glad it isn't but still he had trouble accepting it. I also had trouble accepting his designs because he was making things flat and wasn't making the lines that the 3D paint was great at doing. Truth be told, it's just a pajama top and so it really doesn't matter as long as he likes it. 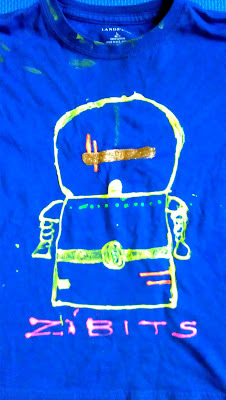 He made a great shirt taking the paint and making huge circular blobs and then used a paintbrush to smooth it out. I actually really like it now. I am glad he resisted my rigidity and just went with his ideas. It would also help to ensure that he thought about the new shirts positively. 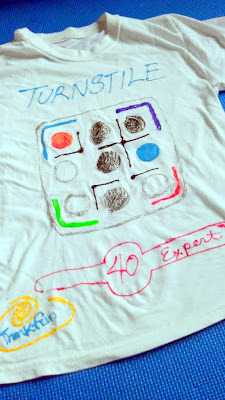 Of course this shirt belongs to Number 2 who now refers to his logic games as "my Smartgames." Trucky 3 is made by Smart Toys and Games, a company that has a great selection of logic games for preschoolers and older kids too. However before that acceptance came, there was this idea to which I kept clinging. I wanted to see cute images. I wanted to see something besides scribbles and shapes. While my children can draw, they weren't used to using this paint and by the time, they get better at it, we may probably run out of shirts. After a while, they got tired anyway and so I took over. 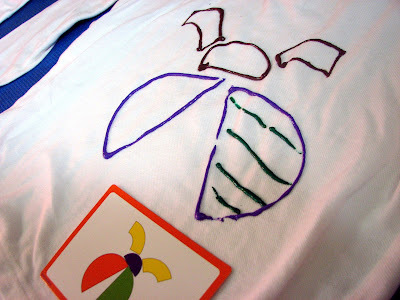 But what is a mom supposed to do on a shirt for her boys? It's not like I'm all that good at this. So I looked around my house, thinking of images to use and all I could see were........ toys, specifically, the toys that I use as tools! Surprised? Why? All homes have toys everywhere but the thing is, I really like my kids' toys and I want them to play with them more and so I took the images of their puzzles and other toys and just drew that with my non-talented hands. I love when he played Lab Mice at night. He is now trying out the Gnomes version. I find that logic games are very calming and stimulating at the same time. It's hard to explain. You just have to play it! I tell him to play these before he plays any video games but after a few rounds, he just goes to bed. They don't bore.... they calm! That's when it hit me. 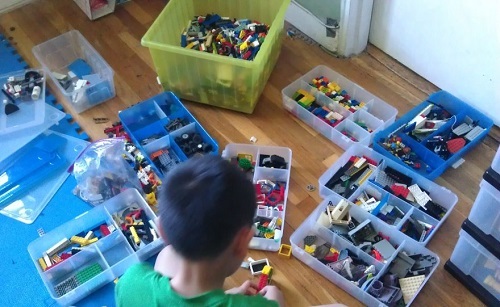 I am creating a little mini-"Play with Good Toys Campaign" in my home. It's like a public service announcement that is somewhat sneaky on my part. Additionally, only my family will see it because they are pajamas and the evening is a perfect time to promote your favorite quiet kid's games like logic games. 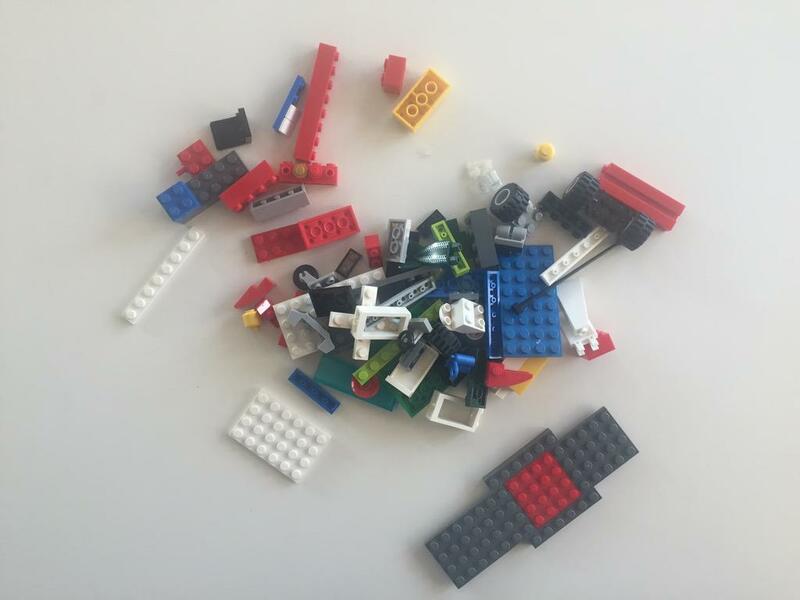 You may be able to do your own work (online shopping, pay bills) quietly while sitting next to them as they draw pictures or complete puzzles (instead of the video games-- or before the video games). I really like them drawing and doing logic puzzles at night. They bring quiet and focus to Number 1 at the end of his day. He is using his hands, eyes, and he's thinking about what is the next move but then at the same time, he's just winding down. 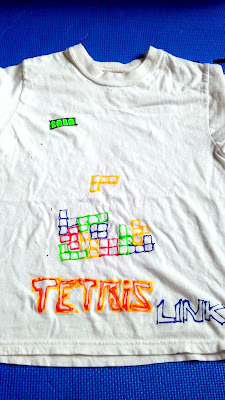 Because Tetris Link will always be cool and pajamas MUST be cool. This is when I realized how important Scribbles are. How else could I create this kind of fun campaign that is less likely to be ignored when projected through traditional mediums like my nagging voice! And like pajamas, toys can be seasonal and so you can "update" your pajamas. You can then "update" your family campaign as they grow by continuing to use the paint to showcase which toys you like for them. And let's face it, some of the toys you find at Toys are Tools are likely NOT being featured on pajamas sold in stores, am I right or am I right? 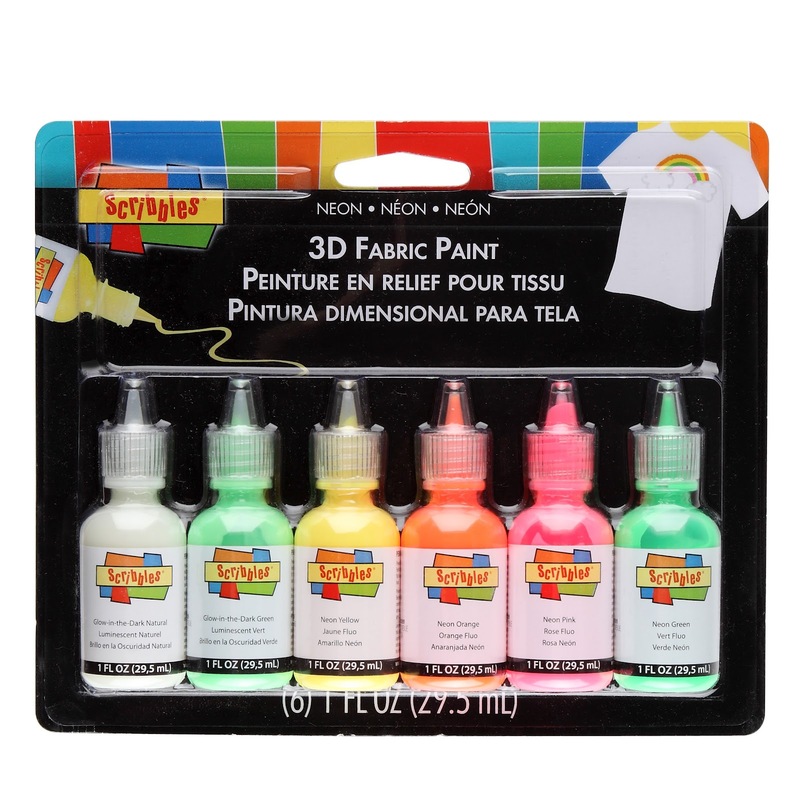 Could Scribbles paint be the only chance I have to do good "Pajama PR" for the toys I prefer? Is there another way to make your game look more fun than painting an image of it on a pajama with bright 3D paint? Number 2 LOVES his Zibits shirt. He can't draw like this yet but that doesn't mean he shouldn't have a Zibit on his shirt, eh? 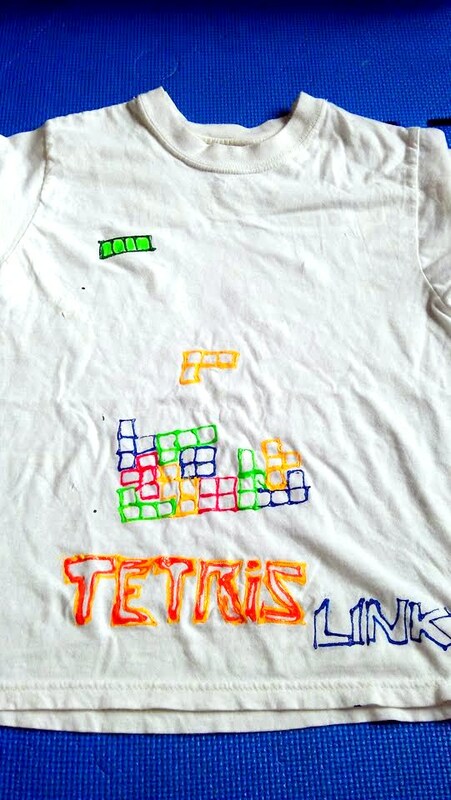 The neon colors look great on darker shirts. 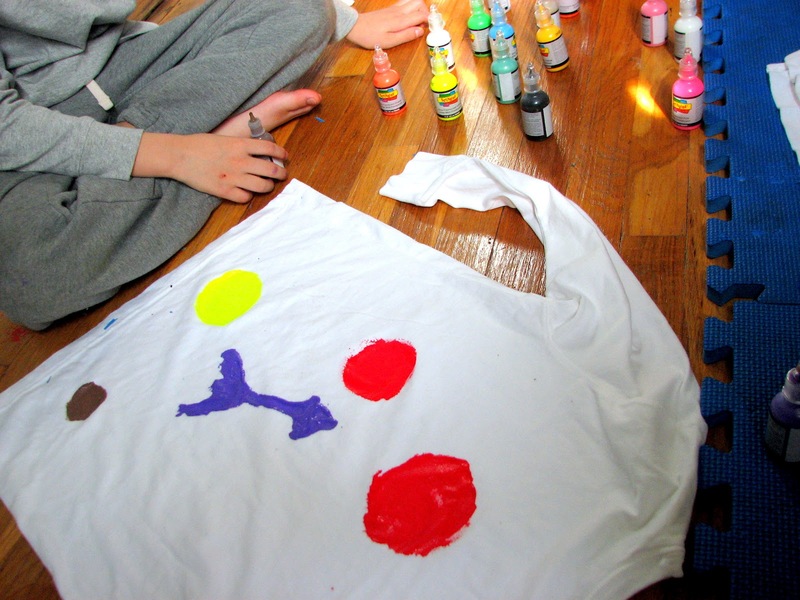 Thus, after my kids had fun with the paints, I set them aside to dry and then I went at the shirts that were waiting to be part of my campaign. I tried to make it as accurate as possible, sometimes, I even put the logos there because logos are really easy to draw! But yes, this was just pure fun (for me) and the kids were so surprised to see their toys on their new pajamas. Everytime they reach for their pajamas, their great toys will be able to make a star appearance in their pre-bedtime ritual. Melissa Sweet's Drawing Book by eeBoo helped me create an artful look for my campaign messages. I don't care if it's only directed at the parents! I know this particular message is geeky but like I said, it's for home. Number 1 loves Melissa Sweet's caterpillars. He saw them in the Drawing Book and in her book, Balloons over Broadway. 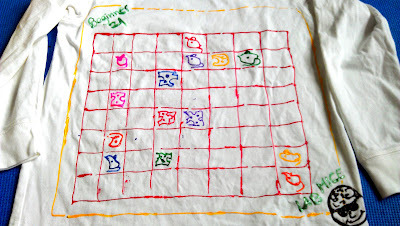 I should note this as well: my kids know that I want them to play with logic games more often. It's not a secret. 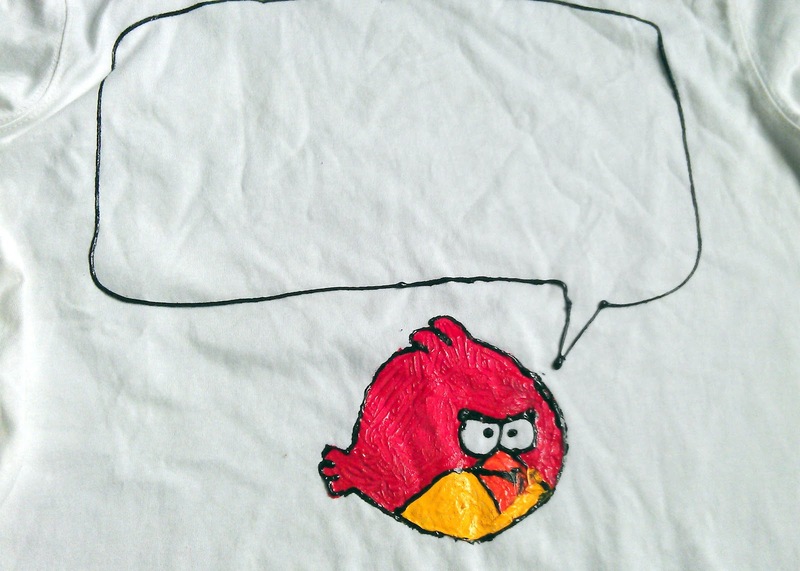 So, just to show that I have a cool side, I drew a picture of Angry Bird. I thought it would be easier than drawing Mario and Luigi. After they saw my Angry Bird drawing, they were shocked! This made me realize that these shirts can be influential. Moreover, it would likely gather attention because the shirts change everyday, so the messages wouldn't get too old. After some thought, I decided to try writing "reminders." Remember, these are pajamas and so they are PRIVATE. Not that reminders are embarrassing but no one really has to see them so you can write anything you like even "Keep Picking That Nose and You'll Bleed." Give reminders without saying one word! It's less stress for me and he finds it fun! I even asked him to draw a face so that he could make his own investment into it. Take it from a former PR person, when you get your target audience to help create the message, they will more likely pay attention to your campaign. But if they are reminders, then reminders for THEM should be on MY pajama tee, right? Who looks at their own shirt all evening long? 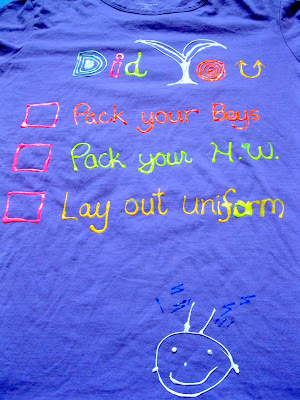 Additionally, just to show that I'm not above reminders myself, I put reminders for ME on THEIR shirts. This made our pajamas more like "family service announcements." 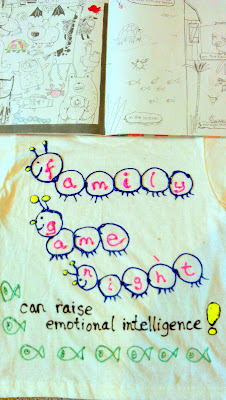 As long I made it look playful, it didn't feel like henpecking to them especially since they had more blank t-shirts and thus more reminders for the parents were made! Darn! "Did you brush your teeth for a full 2 minutes?" with a message on the back: "Thought so - now go back and do it again!" This game review is in the pipeline.... Which games or messages will your pajamas support? 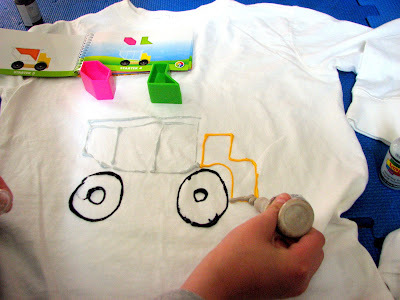 If you think your child will like this or other types of paint for fabric painting, try watching this video for ideas. Those paintbrushes look great for Number 1 Son whose paintbrushes rolled all over our floor. Lastly, I used our paint over a period of at least one month. I sealed the bottles tight and so it appears that you can work on something, seal it and then use it later! Great! Can't wait to find out who wins? Click on the photo for my Amazon link. You win mom of the year for this one! I love the ideas... I think we'd have to have a pj top that said our entire ritual that starts with night night sleep tight and goes on several paragraphs.... I'll need to buy a size L! 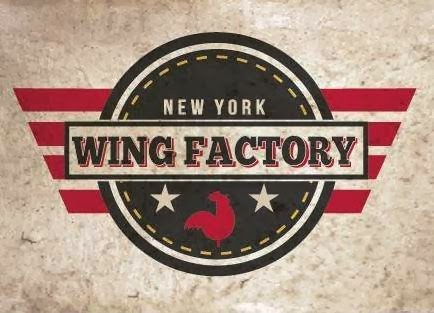 our angry bird would say "it's not fair!!!" He should say, "I love you Mom." Thanks for the kind words! This is no mom of the year anything.... anyone can do this.... it's so easy... I bet anyone with a blank tee and bottle to squeeze will eventually start coming up with something funny for their child. Love it. My kid says "No fair!" every single day!!! "Feed me or cover your ears!" Where does it appear in this review that my life is balanced!!! I think I'm not a very good communicator then! We certainly have clutter and chores are not done here either - even I don't do them! Ask my husband! Still the message is that we can use all the space at we have at home to communicate our message. Even the bathroom is a great place! Erika, I love it but you pressed the wrong button. You are supposed to press the 25 points button which will definitely increase your chances of winning. Good luck! My angry bird would say 'Take aim and GO FOR IT!" My kids do not know angry birds, but since we reinforce happiness here, perhaps, "Turn that frown upside down"